“Look at all those people down there!” said Pope John II from his helicopter. This is the joke Cardinal Timothy Dolan shared with us when he spoke at the Christ Our Life Catholic Conference a couple of weeks ago at Wells Fargo Arena. He characterized the man now known as “Saint John Paul the Great” as the soul of the church. I was one of the guys standing in line at Living History Farms 35 years ago freezing my you-know-what off. And I wasn’t even Catholic at the time! Little did I know the profound impact this man would have on my life, and so many other others. I agree. The wind swirled around the microphone making this Polish Pope’s already thick accent downright unintelligible for those of us listening from the back forty. Stories abound. One of my favorites comes from retired advertising executive, Jim Boyt. He was asked by then Bishop, Maurice Dingman, to transport retired priest, Fr. Francis Ostdiek, to the airport to see the Pope’s arrival. Jim, an Irishman, characterized the good father as a strong-willed German, a sometime toxic combination. Nonetheless, the excitement of seeing the Polish Pope kept everyone on an even keel. The Secret Service gave Boyt and the wheel chair bound priest a choice place to be when the plane arrived. Bishop Dingman and Govenor Robert Ray greeted the Pope. From the ground, Jim could see the Bishop talking with the Pope and pointing their way. God love Pope John Paul II! He made a beeline for Fr. Ostdiek, embraced him and said, “Father, you couldn’t come to Rome to see me, so your Pope comes to Iowa to see you.” To which Fr. 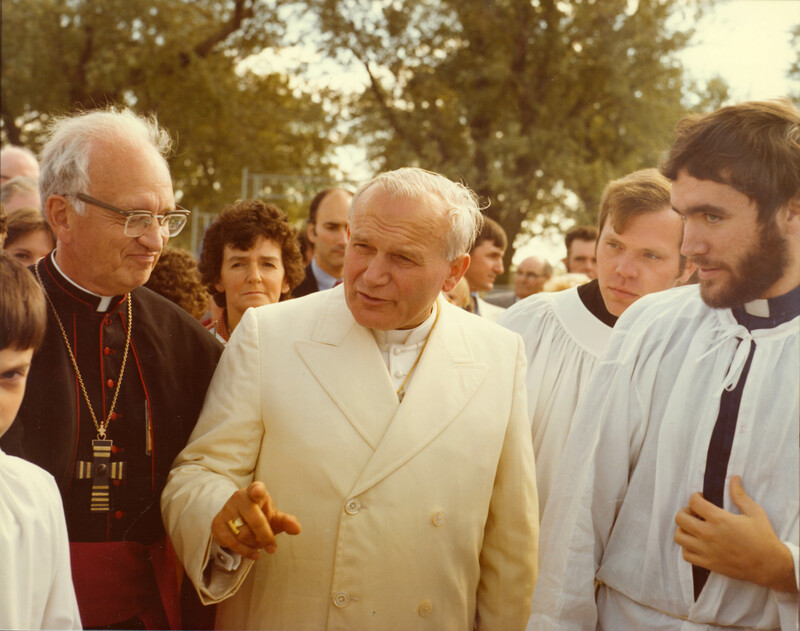 Ostdiek replied, “you know, Your Holiness, I think you’re doing a pretty good job.” JPII howled with laughter. Why did the Pope come to the American Midwest for the first time in history? Because he was asked. An Iowa farmer from Truro, Joe Hayes, wrote to the Pope and invited him to come and talk about land stewardship. Mr. Hayes’ letter was like a mustard seed that grew into one of the biggest events in Iowa history. Seldom has there been a Pope more in love with the land than JPII. He told us that the Church esteems the work of the farmer. He said we must maintain three attitudes in our relationship with the land: gratitude, conservation, and generosity. The Catholic Church is a big, messy family.